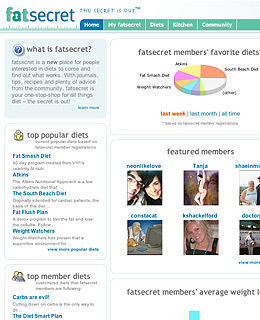 This social network is dedicated to helping people who are trying to lose weight. The site, which is free, uses pie charts and graphs to provide concrete information about what works for its membersand what doesn't. It lists the most popular diets and provides details about their particular approach and stages, and bar charts show progress made by the members who are following it. Read up on Atkins, South Beach, Weight Watchers, the Fat Smash plan and the Fat Flush. Make friends to create a support system; create your own diet and share it with the community. Member-reported weigh-in amounts are posted on the home page, tagged with either a red arrow pointing up or green arrow pointing down along with links to their journal entries. Individual member pages include a weight history, plotted on a graph.